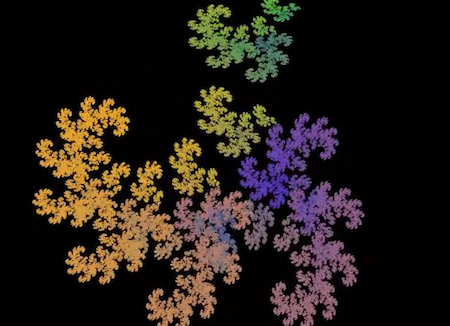 I made an animated fractal video by having the computer gradually update three rotation parameters as it renders fractals for each video frame. The three-minute video took about 45 minutes to render in fancy mode (but in normal mode, TeraFractal can display animations in real time). All of these books use scientific evidence to support ideas that in many ways fly in the face of conventional wisdom. What’s surprised me most is that many of the clear best practices have still not been widely adopted, sometimes decades after first publication. Culture and habits are difficult to change. But I’m still an idealist at heart, and I want to work at a place where learning is rampant, emotional support is plentiful, work-life balance is required, and creativity is allowed to flourish. Not just to pay lip service to these things, but to achieve them for real. We know that happier employees do better and more valuable work, and we know how to create this kind of environment. It just requires upsetting a lot of the assumptions of mainstream business culture. I came up with a partial list of what I see as indicators of organizational health. These are meant to be provocative, since most companies do not fit all of these descriptions. Also, I realize that in many cases the devil is in the details, and taking these ideas to the extreme would generally be disastrous. But I stand behind the overall goals. Employees should goof off and be silly together. If not, the community is weak and team members need to get to know each other better or be re-assigned. Employees should go home early more often than work overtime. If teams feel the need to stay late, there is too much pressure and not enough focus on long-term priorities. Employees should typically be working on something different than last year. If not, we have stopped learning; work will become boring and our products and culture will become stale. Employees should frequently make mistakes and celebrate them. If everything works on the first try, then we are not being creative enough. Employees should feel comfortable challenging any assumption or idea. If the boss is always right, team members feel shut out. If crazy ideas are not encouraged, the environment is not supportive enough. Evaluation should be qualitative. Easy metrics such as quotas and billable hours convey a lack of trust and reduce our intrinsic motivation. Achieving goals like these will always be a work in progress, but I think they are worth striving for.